Please note that the content of this book primarily consists of articles available from Wikipedia or other free sources online. Safune is a traditional village district on the central north coast of Savai''i island in Samoa. It lies within the electoral constituency of Gaga''ifomauga. 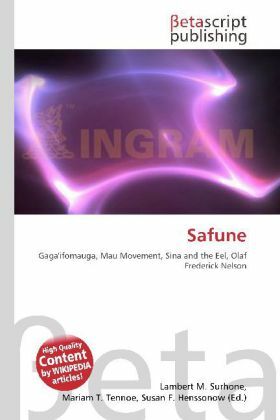 Safune is the birthplace of Mau leader Olaf Frederick Nelson and the film location of Moana (1926). The Mata o le Alelo pool associated with the Sina and the Eel Polynesian legend is also in Safune. The villages within Safune are Matavai, Faletagaloa and Fatuvalu as well as smaller traditional land boundaries, Faleolo and Lalomati. Olaf Frederick Nelson, a leader of the Mau, Samoa''s independence movement during the colonial era in the early 1900s, was born in Safune on 24 February 1883.